The civil-militia coup in Venezuela, led by Hugo Chavez, that began on February 4, 1992, was a response to the social discord regarding the ‘pacted’ democratic system that had been in place since 1958. The pacted democracy, a written guarantee that the signing political parties would respect the election results, prevent single-party hegemony, collaborate to fight the rise of a dictator, and share oil wealth. However, as oil revenue began to decline, the public lost faith in the political institutions. The government became violent in order to suppress opposition and maintain power. Hugo Chavez, at the time of the coup, had the loyalty of about 10% of the Venezuelan military force. Five army units moved into Caracas to seize crucial military and communications installations throughout the city, including taking control of the Miraflores Palace, the presidential palace. Chavez’s ultimate goal was to capture President Carlos Andres Perez on his way home from an international trip, and allegedly execute him. In November 1992, there was a second coup attempt. The rebels, who had been in contact with Chavez, took over the state-run TV station and broadcasted a video Chavez made while in prison which called for a popular uprising. The coup, however, largely failed. 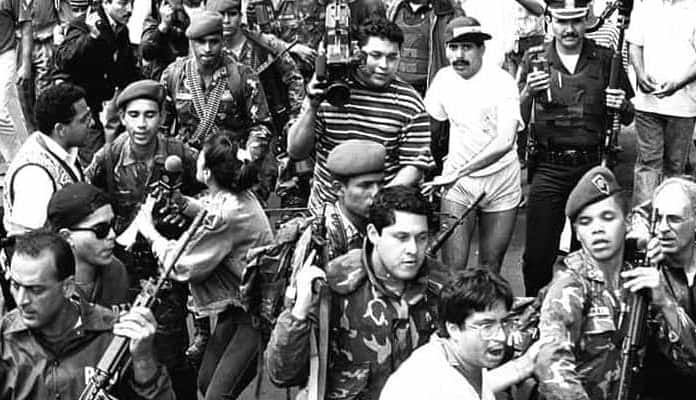 The coups, were, however, successful in ruining Perez’s public image and discrediting the neo-liberal capitalist reforms and President Perez was impeached on May 20, 1993. Former President Rafael Caldera won the subsequent election and pardoned Chavez, which allowed Chavez to run in and win the 1998 presidential election.